Send details of Market Street, Thornton to a friend by completing the information below. 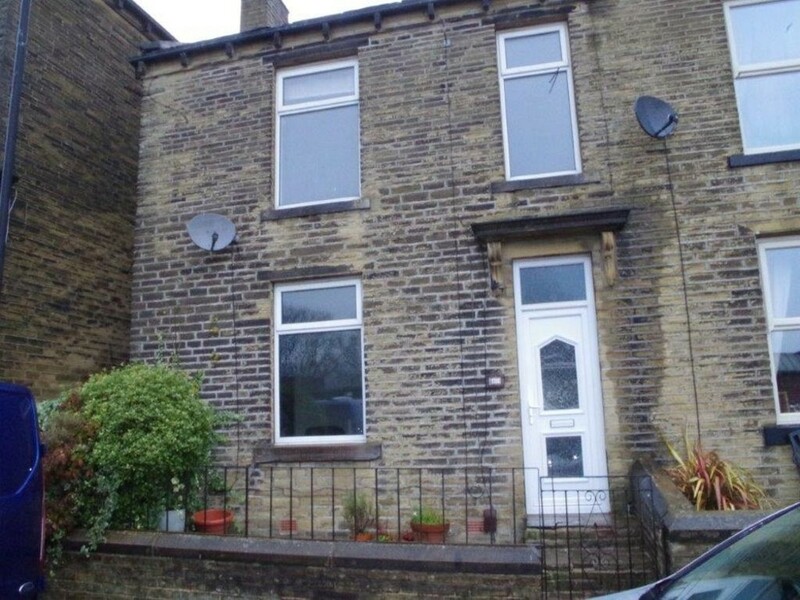 **NO UPWARD CHAIN** Situated in the heart of Thornton Village with The Bronte Way, Great Northern Railway Trail and all amenities close by is this spacious End Terrace which briefly comprises of Lounge, Kitchen, Two Bedrooms plus an Occasional Bedroom, Bathroom and Separate WC. UPVC Windows and Central Heating. Enclosed Yard to rear. ENTRANCE Via UPVC front door to a spacious hallway with central heating radiator, cornice and door to lounge. Steps down to the lower floor kitchen.Two sets of stairs to the first floor one leading to the bathroom and the other to the landing. LOUNGE 13' 7" x 12' 1" (4.14m x 3.68m) UPVC window. Cast iron solid burning stove set into the chimney breast with a tiled hearth. A few steps leading down to the kitchen. KITCHEN 11' 2" x 9' 0" (3.4m x 2.74m) The Kitchen is split into two parts the first part has a UPVC window. Modern work top with pot sink and mixer tap. Plumbing for washer. Tiled floor. Central heating radiator. Open down to the second part of the kitchen. KITCHEN/DINING ROOM 10' 7" x 6' 9" (3.23m x 2.06m) This part of the kitchen could be made into a dining room. Tiled floor. Central heating radiator. LANDING Doors to bedrooms and WC. SEPARATE WC UPVC window. Low level WC. BEDROOM ONE 12' 9" x 12' 0" (3.89m x 3.66m) Two UPVC windows. Feature open iron fireplace. Central heating radiator. Cornice. Door through to an occasional bedroom. OCCASIONAL BEDROOM 13' 1" x 5' 8" (3.99m x 1.73m) UPVC window. Fitted wardrobes. Central heating radiator. BEDROOM 16' 5" x 13' 4" (5m x 4.06m) Two UPVC windows and a UPVC side entrance door. Central heating radiator. Cornice. Door through to the bathroom. BATHROOM 10' 3" x 6' 8" (3.12m x 2.03m) UPVC window. Two piece suite comprising of bath with shower over and hand wash basin set in a vanity unit. Complementary tiling. Central heating radiator. Door through to the bedroom and door to stairs to ground floor. EXTERIOR Small garden to front. Enclosed patio to rear.